Having already delivered five-star worthy tablets in the shape of the Asus Transformer Prime and more recently the Google Nexus 7, the Asus Transformer Infinity is the newest member of the slate family brandishing a full HD display and the familiar tablet/keyboard dock design that we loved when we first had our hands on the original Transformer. Unlike the mid-priced Asus Transformer 300, the Infinity is the Android tablet which is Wi-Fi only for the time being, is for those that have a bit more money to play with. With a gorgeous design and mammoth battery life, we put the Infinity through its paces to see if the it is as good as it looks. If you're a fan of the Transformer Prime, Asus has maintained that brushed metallic finish for the Infinity Pad which matches the new iPad not only in sleekness but manages to avoid looking like the stream of Android tablets that make it on to the market these days. The 10.1-inch Pad with its thick black bezel, measures in at 8.5mm thin which makes it significantly more slender than the new iPad (9.4mm) but is actually slightly more portly than the Transformer Prime (8.3mm). The Infinity tablet also jumps to 598g from the Prime's 586g but still weighs in less than the new iPad Wi-Fi model (652g). When you factor in the keyboard dock, things do of course get slightly heavier, so now we are talking netbook terms here but it's not going to add significant bulk when carrying it around in your bag. Protecting the 10.1-inch Full HD LED Display is scratch resistant Corning Gorilla Glass 2 up from the Corning Gorilla Glass used for the Prime which helps to keep the screen thickness down but more importantly protect against scratches and damage resistance. On/Off and volume rocker sit on top of the device in landscape mode with microSD, microUSB and headphones jack on the left edge of the device and the charging/sync port at the bottom. On the back you'll find the 8-Megapixel camera and the single stereo speaker. The Chiclet style keyboard and trackpad which is the same as the one found on a 10-inch Eee PC and the Transformer Prime is where you'll find standard USB and SD card slots and charging port. The hinged display connects to the tablet via two latches and the syncing/charging port. Even going back to the Asus Transformer, the brand has delivered clear, bright displays but the Infinity is the first to host a 1920x1200 Full HD screen. As soon as you cast eyes over the screen, it's the brightness and sharpness which strikes you first, particularly with the text on the homescreens and web browsing. This is somewhat let down by the app icons which are clearly not optimized for the higher resolution surroundings, but it's video where the full HD resolution really excels delivering excellent clarity and great vibrancy. The 224 PPI is some way off the new iPad's 264 PPI, but it surpasses the pixels squeezed into the leading Android tablets to deliver rich blacks and the impressive levels of clarity. The Corning Gorilla Glass and Super IPS+ mode which can be selected in the ASUS custom settings helps delivers a brighter screen that makes it more outdoor-friendly but at the detriment of your battery. This is simply a beautiful, glorious display that is comfortably up there with the new iPad in terms of performance. The Transformer Prime was the first tablet to get upgraded to Ice Cream Sandwich and it comes as no surprise that the Infinity comes with Android 4.0 out of the box. It is much the same as what we've seen before with homescreens, app drawers, new camera features and the notification bar among other things but unlike the Samsung tablets, everything feels much more slick and polished. Thankfully the Asus custom settings gives some variation in the way some of the Ice Cream Sandwich features work like changing the way you can take screenshots for instance. With the slow introduction of tablet optimized Android apps on Google Play, Asus, like Samsung, attempts to push you through what it considers to be ideal content for the Infinity but ultimately it feels a bit life an afterthought. Take for instance the @vibe Fun Center which is Asus' take on an iTunes-like store where you can buy music, books, apps etc. The problem is that the interface is horrible to use, and lacks the same polish dedicated to the hardware. It's also worth noting that some of the so-called free premium apps are simply nothing more than free trials which is not really made clear. While we can wax lyrical about the full HD screen, the overall multimedia experience is let down by the sole stereo speaker which is powered by Asus' own SonicMaster technology. There is no doubt that it rates well in terms of loudness, but you'll soon hear a bit of distortion when you really turn it up and if you are holding it in landscape, it's virtually impossible not to cup the speaker and muffle the sound output. Thankfully, there's no problem in the power department with the zippy NVIDIA Tegra quadcore processor running at 1.6GHz and a fifth core for less demanding tasks means it runs quick and smooth as the Transformer Prime and the Nexus 7 and is particularly good for running and playing games with minor frame rate issues. Asus still manages to pack an 8-Megapixel rear-facing camera that makes it one of the best tablet cameras on the market. With the addition of the auto focus, LED flash and the F 2.2 aperture, the extra amount of light allowed through the lens means clearer photographs than the Prime with great detail, however it lacks the vibrancy and the zoom to catch great pictures from a distance. The front-facing camera has jumped from a 1.2-Megapixel to a 2-Megapixel sensor with 1920 x 1080 resolution which takes fairly sharp self-portrait pictures, but HD video calling is the real benefit here. Shooting in 1080p Full HD video can be rewarding if in the right conditions, particularly in brightly lit locations as footage can look at little washed out otherwise, but it nonetheless does a decent job of capturing video. One of the big selling points of the Transformer series is the battery life. Whether it's the cheaper Transformer 300 or the pricier Transformer Prime, all have excelled in this department. Asus claims the Infinity delivers 14 hours (9.5 hours with Pad, 4.5 with dock) which is down from 18 hours in the Prime and probably has something to do with the new higher resolution screen. With both tablet and keyboard dock fully charged and in general use throughout the day streaming video over Wi-Fi and gaming we managed to get a considerable three or four days out of the Infinity before we had battery issues. The tablet on its own managed around 7-8 hours which is lower than the new iPad but if you have the docking keyboard handy, you will have plenty of tablet time to play with. 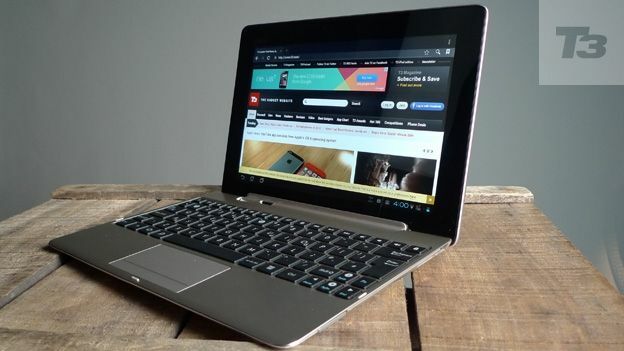 The Asus Transformer Infinity is almost a case of, 'it ain't broke, don't fix it'. Many of the specs are identical to the excellent Transformer Prime including the comfortable keyboard dock, quadcore processing power and storage options (albeit with a lower battery life). Throw in the beautiful full HD screen and we begin to see why the Infinity is being pushed into ultrabook and MacBook pricing realms. We still have a major gripe about Asus not supporting USB charging which seems like a really simple thing to introduce. The speaker performance really lets down what is potentially a great place to watch movies and listen to music, and we wonder if the same love and attention goes into the Asus applications as it does for the brilliant hardware. If you're after a tablet that offers laptop-like functionality with the power, portability and specs to make it both work and multimedia friendly, this is the tablet to have in your sights. Asus Transformer Prime owners may want to hold tight for the next instalment, because new screen aside, all the boxes are already ticked.